Divorced Israeli fathers file multi-million dollar U.S. lawsuits against funds, Israeli government, women's groups. Divorced Israeli fathers have filed multiple multi-million dollar lawsuits in the United States against funds including the International Fellowship of Christians and Jews and the New Israel Fund (NIF), as well as Israeli Welfare Minister Moshe Cachlon and Minister of Justice Yaakov Ne'eman, and several women's organizations. More fathers are expected to join the existing lawsuits in the coming weeks. A lawsuit based on the Alien Tort Claims Act was filed in the Federal Court in Newark, New Jersey by an Israeli father, Sharon Ben-Haim, and two dual Israeli-U.S. citizens, Likud Central Committee member Gamliel Elmalem and Sol Havivi. The lawsuit's defendants include Supreme Court Judge Edna Arbel, Rabbi Daniel Edri of the Haifa District Rabbinical Court, and three top welfare officers – Simona Steinmetz, Batya Artman and Niva Milner. The lawsuit seeks over $26 million from each defendant, “for gross violations of human rights and torture arising out of an institutionalized discriminatory policy of disengaging and separating fathers from their minor children." A U.S. court has found that Ben-Haim's ex-wife kidnapped their two year-old daughter from the U.S. to Israel. When New Jersey Superior Court Judge Bonnie Mizdol ruled that the daughter must be returned to the U.S., the Israeli Supreme Court, in a panel headed by Judge Arbel, chose to ignore her ruling. Judge Mizdol determined that the Supreme Court of Israel acted in contravention of the Hague Convention and refused, in turn, to accept its decision. She again ordered that the girl be returned to the U.S., but Israeli authorities are not complying with her decision. 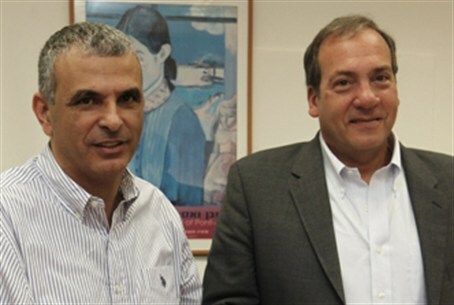 Regarding the ICFJ, the lawsuit states that its president, Rabbi Yechiel Eckstein, has been misleading his donors, most of whom are devout Christians who believe in the unity of the family, by transferring money to bodies in Israel that encourage divorce and "single parent" households. The IFCJ, NIF and the German Konrad Adenauer Stiftung (KAS) are blamed for supporting institutions and organizations which allegedly "spread gender propaganda, encourage hatred between the sexes, foment discord between men and women and increase the maltreatment of divorced fathers and their forced separation from their children." The plaintiffs say that Israel discriminates against fathers by forcing 20%-25% children of divorce to see their fathers in supervised "visitation centers" for one hour a week – a rate of supervised visitation that is more than 10 times higher than in the United States. Child support payments in Israel are four times higher on average than in the U.S., they claim, compared to earnings. Two additional $20M lawsuits against bodies that donate to Israeli women's organizations were filed by David Weisskopf, an American living in Israel, who was completely cut off from seeing his small children by the welfare system for several months before being forced into a supervised visitation center for over a year. The IFCJ responded thus to our inquiry: "Four years ago the Fellowship gave a gift of $375,000 to a number of organizations to build playgrounds for children in 52 day care centers in Israel. One of those groups was Na'amat. Recently we received notice of the lawsuit against a who's who in Israel listing us as well. The matter is being handled by attorneys." Attempts to receive the reactions of the NIF and the KAS were unsuccessful.